The Ice Power Cold Gel has been shown to ease pain and enhance the rehabilitation of soft tissue injuries. The results of the very first scientific study on the effects of a cold gel (which was carried out in Finland), have recently been released. An abstract on the results has been published in the reputable The American Journal of Sports Medicine. According to the study performed in Helsinki, Tampere and Kuopio, the use of a cold gel decreased the experienced pain by 50 % already during the first week of use. 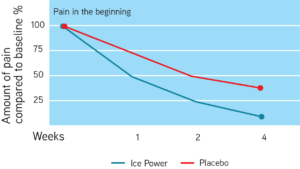 The decrease in pain experienced by the placebo group during the same time period was only a little above 10 %. The degree of disability also decreased significantly faster among the patients using the cold gel compared to those using placebo. The study included a total of 74 patients with clinically proven soft tissue injuries in their ankle, shank, arm or knee. The chief physician of this trial, docent Olavi Airaksinen from Kuopio University Hospital, emphasizes that the amount of patients was big enough to show scientific evidence . For this study, the patients were randomised into two groups. 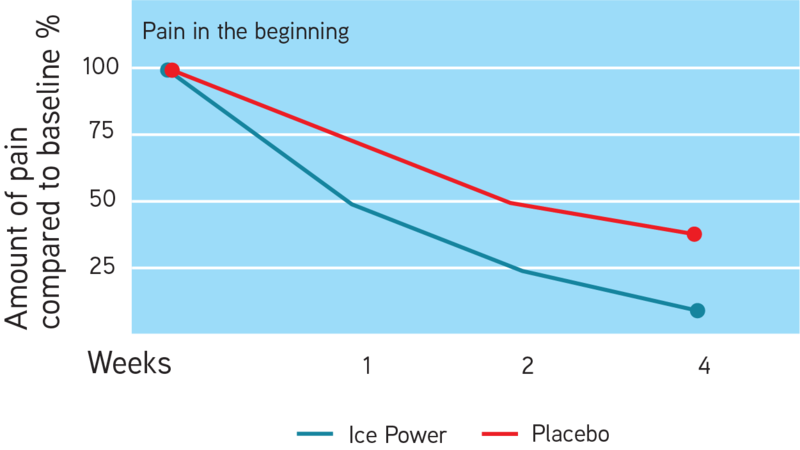 One of the groups used the Finnish Ice Power Cold Gel four times daily for two weeks, while the other group was randomised to use placebo. A specialist physician examined the patients after one, two and four weeks. The patients of both groups were allowed to use NSAIDs and bandages during the study, but no other gels except the study gel were allowed. – The degree of pain was assessed both in rest and during movement using the VAS scale. Other benefits and the patients´ satisfaction with the treatment were also measured by a questionnaire and phsyical examinations, says Olavi Airaksinen. The effect of the cold gel starts immediately at time of application. In the study performed, the pain was measured weekly using the VAS scale. After the first week of treatment, the pain experienced by the patients using Ice Power Cold Gel had decreased from 59 (on a scale from 0 to 100) to almost the half, i.e. to 30. During the same period of time, the pain experienced by the group using placebo, had only decreased from 58 to 45. After two weeks the pain scores were 14 and 26, and after four weeks 7 and 13, respectively. According to a patient questionnaire, 80 % of those having used the cold gel were pleased with their treatment. The corresponding share of the patients having received placebo was 44 %. The patients having used the cold gel were also more eager to use the same treatment in connection to a possible new injury compared to the patients having received placebo. In connection to this study, the physiological effects on skin blood flow initiated by the cold gel and other topical treatment creams available on the market, were also investigated in 20 patients. The tests were performed in a laboratory environment. The cold gel showed significant differences compared to the other products. The Ice Power Cold Gel improved the blood flow by 300 %, while the results obtained with other products only achieved values of 20 – 30 %.